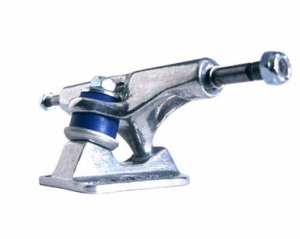 One of the most important parts of the skateboard, trucks are the metal part that connects the deck and wheels. Three important areas to consider when buying trucks are height, bushings, and axle length. The general rule with truck height is: the lower the truck, the more stable and easier your board will flip. Low trucks go well with smaller wheels and are idea for street skating. Higher trucks allow you to use larger wheels, which is great for vert and skateboarding at higher speeds or longer distances. The little rubber donut inside of the truck is the bushing. It supports and cushions the truck when it turns. The harder the bushing, the more difficult it is to turn and the more stable the skateboard. Likewise, the softer the bushing, the easier it is to turn. If you’re getting a brand new board, I highly recommend getting stuff bushings. They will break in and become softer over time. Seasoned skaters should use medium bushings, since they are already adjusted. Soft bushings should only be for skaters who spend most of their time cruising and carving, as they made the board turn rapidly and requires a lot of control. The axle length of your trucks should depend on the size of your board. You want your trucks to match the size of your deck. Ideally, the width of your trucks should be to within ¼” of the width of the deck. Fury trucks are very light and turn smoothly. They come with glued on risers and are available in plenty of colors. The only problem I have with them is that the bushings they come with aren’t the best and you’ll probably want to replace them. Grind King has a reputation of making extremely strong and light trucks. However, when I tried them, I found that the metal wore off really quickly. After grinding a couple of times, my trucks wore down a lot. This is just a preview. The entire section has 415 words. Click below to download the full Secrets of The Secrets of Skateboarding.